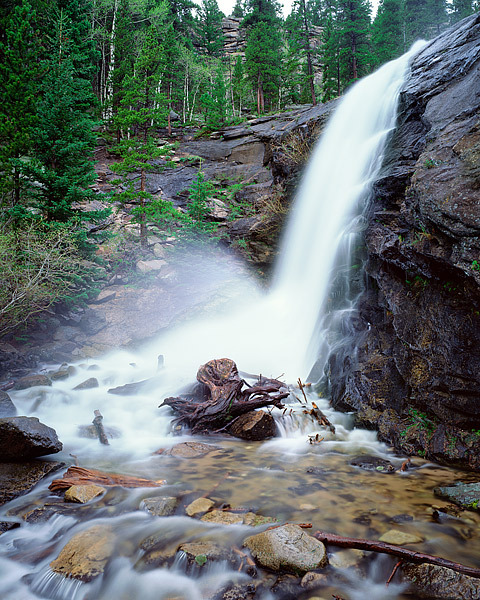 Cow Creek tumbles 20 feet over the granite and rock that forms Bridal Veil Falls in Rocky Mountain National Park. Rain and mist was falling on the spring green aspen tree's the surround Bridal Veil falls and Cow Creek was flowing at a brisk pace. Bridal Veil Falls is a pleasant 3 plus mile hike along Cow Creek. Photo © copyright by Thomas Mangan.